Our Asset Recovery program is an exceptional resource for your company. We offer cash for parts and products you don’t need. 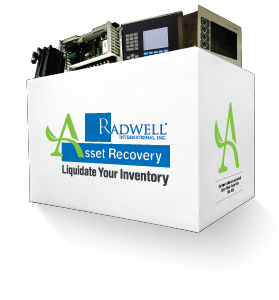 In many cases, selling your excess inventory to Radwell gives you the opportunity of adding dollars to your bottom line. Want to know how easy our Asset Recovery Program is? Click "I want to learn more" below or if you want to start the process click "Sell My Product". How does selling industrial parts help? "On average, almost 20% of manufacturers’ total assets at any point in time are surplus to the needs of the organization." Do you have questions about hiring a surplus equipment buyer? Read our recent blog post What to Ask Before Hiring A Surplus Inventory Liquidation Service. It covers the basic questions you should ask yourself; Are you selling your surplus inventory to a real company? Will the service you hire recycle any items that are no longer usable? - Find More Information About Radwell International, Inc.